The U.K. election could lead to a referendum on Britain's future in the European Union. Britain's future in the world's biggest trading bloc could be thrown into doubt by May's general election. Prime Minister David Cameron's Conservative party has promised to hold the first referendum on the U.K.'s membership of the European Union in 40 years if it wins power again. Cameron says he wants Britain to stay in a reformed EU; the main opposition Labour Party says he's playing with fire by offering a vote in the first place. The costs of EU membership are significant, and the burden of red tape -- along with a sharp rise in immigration -- are other factors cited by British politicians who want to turn their back on the EU. Regulation generates many complaints. London-based think tank Open Europe says the 100 most expensive EU laws cost the British economy £33.3 billion ($49.7 billion) each year. But that figure doesn't reflect any benefits derived from those laws, like helping facilitate trade across the 28 countries that form the EU single market. Then there's the EU budget. The U.K. government forecasts it will spend around £9 billion ($13.4 billion) each year after deductions until 2019. Limited control over how that money is spent is another disadvantage. Berenberg economist Rob Wood says the EU budget is a "giant merry-go-round:" pay money in, and some of it comes back. Take farm subsidies. Around 40% of the EU budget is spent on agricultural subsides. The U.K. gets a budget rebate -- worth about £3.6 billion ($5.3 billion) in 2013 -- to reflect the fact that its agricultural sector is small relative to the rest of the EU. 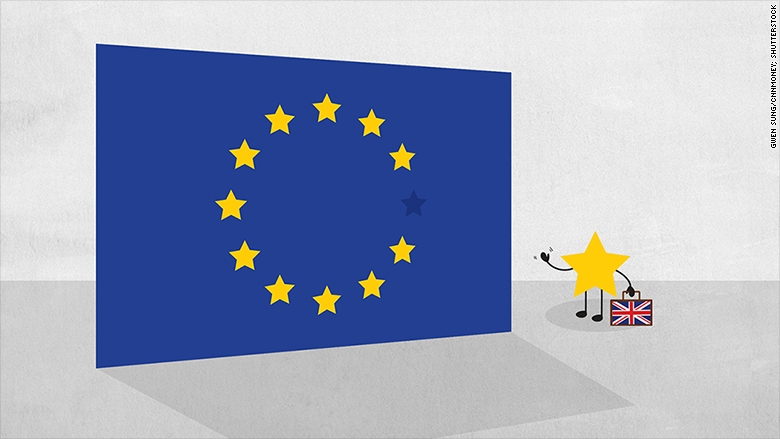 Still, EU advocates say the benefits of Britain's membership far outweigh the costs. Among those are increased competition and access to markets, higher foreign direct investment, and the free movement of labor, which opens up opportunities while keeping wage costs down. About half of Britain's trade is with the European Union. "The point of the single market is to make trading easier, and the evidence says it does, that it adds significantly to trade flows," said Berenberg's Wood. Influence that comes with being part of the world's largest economic bloc is another key benefit. The EU carries more negotiating power than Britain would by going it alone. Related: Will Britain pump more tax out of the super rich? That point was underscored by former Labour Prime Minister Tony Blair this week, who argued that an EU-exit would leave Britain "diminished in the world." "Think of the chaos produced by the possibility, never mind the reality, of Britain quitting Europe," Blair said in a speech. "Jobs that are secure suddenly insecure; investment decisions postponed or canceled; a pall of unpredictability hanging over the British economy," he said. The government says more than 3 million jobs are linked to the export of goods and services to the EU. So would Britain be better off in, or out? Most economists say it's not clear cut. How Britain would fare depends on the shape of any new deal it could negotiate with the EU for life on the outside. "The U.K. could end up better off if it managed to maintain all the trade links and got back control over areas that reduced the red tapes costs to the economy," said Capital Economics economist Vicky Redwood. Open Europe analyzed a series of scenarios for a U.K. exit, and concluded the most likely outcome would be for a rise or fall in GDP in 2030 of less than 1%. For Berenberg's Wood, it's yes to Europe. "The EU provides access to a free trade project unparalleled in the world, which boosts productivity and output," he said. "It comes with costs, but the benefits outweigh the costs."